When Audrey breaks up with her boyfriend Evan, she has no idea that it will inspire him to write a song. Or that The Song will become an international pop sensation and rocket both of them into fame. But it does. 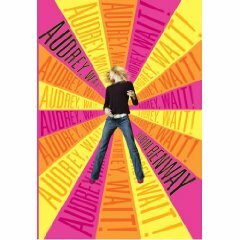 And as the pappazzi descend and life goes crazy around her, Audrey manages to discover a great deal about herself even as the rest of the world has trouble seeing it. A nice light read, full of plenty of convenient plot twists that eventually wrap up better than fine in the end. And while Benway gives profuse kudos to Rachel Cohn (and has a debt to Meg Cabot as well), this is a much better indy-rock themed book than The Book About Two Teens in the Indy Rock Scene That Recently Became A Movie. Unfortunately, it will age about as poorly (as much as I would like to imagine that kids will be rocking to Death Cab for at least another decade!). Escapist fun!